Surgeons and other healthcare professionals in the Surgery Department at Temecula Valley Hospital work with advanced equipment, tools and techniques for both inpatient and outpatient surgical procedures. 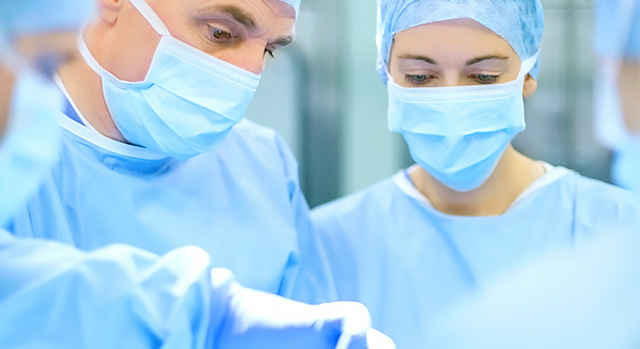 A variety of same-day surgery procedures can be performed at TVH. Patient care begins with the physicians, who diagnose the most appropriate treatment. Their diagnosis provides the foundation for highly effective surgeries and recoveries. Surgeons use both traditional and minimally invasive surgical techniques. A professional perioperative team, including an anesthesiologist, a registered nurse and a specialty surgical technician, is always present in each operating room to ensure high-quality care. They assist in techniques that lower infection rates and help you heal faster. The highly trained staff provides diagnostic and surgical procedures 24 hours a day, seven days a week, to meet the surgical needs of each patient. The Surgery Department's mission is to provide medically advanced, high-quality surgical services for all patients. The surgical expertise at TVH includes management of the most common ailments. In the past, open surgery was the only option available to surgeons when they needed to see inside a patient's body or remove or repair an organ. But today, minimally invasive technology is changing the way doctors approach patient care. Previously, having surgery meant spending several days in a hospital and weeks in recovery, leaving you with lengthy scars. Today's new minimally invasive procedures have helped changed that. Using advanced technology, surgeons make small, pencil point sized holes in the body while video equipment provides a magnified view of the surgical site. Surgeons perform the surgery through the incisions so patients often experience smaller scars and faster recoveries. The PACU provides nursing care to patients that have received an anesthetic for surgical or procedural intervention on an inpatient or outpatient basis. If you need a referral to a physician at Temecula Valley Hospital, call our free physician referral service at 855-859-5203.